Clarity Matters was born out of sheer observation, sitting in a cafe looking at the bookshop next door, while I waited for Brian my husband at his business coaching appointment. I thought if that was my bookshop, I’d take the broken old blind off the window, move the tall fixtures to the back of the shop to open it right up and make it more welcoming, get rid of all the boxes that accumulated around the counter tripping people up and so on. So I made a list of all the changes I thought may help the store owner from the female perspective and from the customer’s perspective. I was so excited that I gave the list to Brian when he was finished his coaching appointment which resulted in the client asking me to work with him for 2 days to make the changes. Hence the official start to Clarity Matters and decluttering in 2002! Quite often, having someone from outside the family can be helpful when sorting through clutter. There can be an enormous amount of shame associated with clutter, so dealing with that can be challenging and even overwhelming to start with. It’s become obvious in my experience that family members helping another family member sometimes is not that effective, for a variety of reasons. The decluttering process is so much more than just clearing out spaces in homes and offices. Where people have a struggle with letting go, for whatever reasons associated with their life experience, stepping in and clearing out for them can be extremely traumatic. Invariably, in these situations, the clutter will end up returning in a short period of time. Helen Maguire at Clarity Matters has a nursing background and a big caring heart that she brings to her clients. She has walked her own challenging life journey and has extensive knowledge of the way people function according to their backgrounds and circumstances. Caring for her clients is number one. She works with people to sort through their possessions at the rate they feel comfortable with, taking into account their individual situation, treating them with dignity and respect along the journey. She is compassionate and nurturing and treats others as she’d like to be treated. She is a woman of integrity who accepts people as they are, with a non-judgmental attitude. A listening ear, a smile and a hug when needed are all freely available. Creativity, making space where there seems to be no space and attention to detail are other characteristics of Helen’s that enable her to declutter your environment, simplifying your life and giving you hope for your future. Helen’s business experience includes 8 years in Nutrimetics, with nearly 300 people in her team. She has worked as a receptionist and frequently organised storerooms and filing cabinets in a variety of business premises before Clarity Matters. Helen is a a totally practical person who has a natural gift to help you, inspire you, motivate you and get the job done, creating what you thought was impossible in your home and office and clarity out of clutter. Helen is way more than a declutterer and a personal organiser. 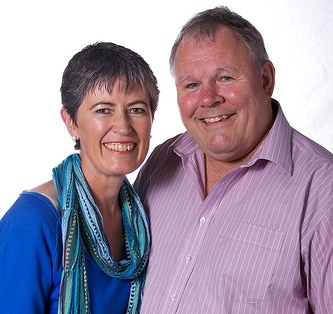 PS – Helen is married to Brian, her gorgeous Irish husband of 19 years and works in the Northern Beaches of Sydney and beyond. PSS – Helen enjoys walking, bike riding and playing the Ukulele. 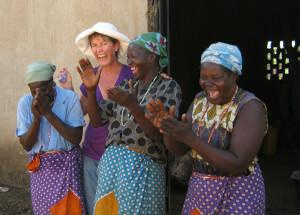 She also loves taking teams of women to developing countries. Uganda has been her focus for the last 10 years.